After the success of the British TV series Spaced, Simon Pegg and director Edgar Wright wrote the script for a zombie movie partially based on the episode “Art.” The end result was Shaun of the Dead, which not only rose Pegg and Wright to international stardom but became one of the most beloved comedies of the past decade. And deservingly so. Shaun of the Dead is a movie that has about as much wit and cleverness as it does blood and gore. It’s a lively, exuberant take on the zombie genre filled with action-full scenes and memorable dialogue. Shaun of the Dead revolves around an eponymous protagonist (played by Pegg), a twenty nine year old television salesman whose life has no direction other than going to the local Winchester pub or playing video games with his best friend Ed (Nick Frost). Shaun’s life falls quickly apart in the beginning of the film. He receives no respect from his fellow employees at his job, his stepfather Phil (Bill Nighy) openly dislikes him, and his girlfriend Liz (Kate Ashfield) dumps in in fear that she’ll spend every evening in the pub if she stays with Shaun. Lonely and lovesick, Shaun is about into the crevices of his life, until London is faced with a zombie epidemic. The zombies don’t arrive until about twenty minutes into the picture (though their are subtle hints of their upcoming entrance), but once they do, chaos reigns all over town, though Shaun remains ignorant of the fact until one comes onto his lawn. Realizing that the world may be facing an upcoming apocalypse, Shaun decides to rescue his mother Barbara (Penelope Wilton) as well as Liz and her two roommates Di (Lucy Davis) and David (Dylan Moran) and take them to where he and Ed deem to be the safest place: the Winchester. Shaun of the Dead really is less about the zombies and more about Shaun’s personal redemption, a smart move by Pegg and Wright. The entire movie revolves around Shaun trying to win Liz back, earn Phil’s respect, and prove he isn’t a loser. The zombies more or less are an obstacle in Shaun’s way. Shaun of the Dead could easily trudge through the territory that operates in most spoof movies, but with its heart and soul it’s something much more and easily transcends the genre. That isn’t to say Shaun of the Dead doesn’t have fun with zombies. Quite the opposite. Shaun uses a cricket bat as a weapon for whacking off the opposing undead, and Wright takes much delight in composing highly stylistic fights (the best of which involve Shaun and his friends beating up a zombie with pool sticks to the tune of Queen’s “Can’t Stop Me Now”), a tribute that’s defined Wright’s Cornetto trilogy. The movie is filled with much gore and violence (one character has a very gruesome death that’s simultaneously shocking and really funny) that it pays homage to George Romero, the king of all things zombie related. While Hot Fuzz may be the most satirical and The World’s End the most mature, Shaun of the Dead may be the funniest of the three. It’s a true piece of comedy as well as exhibiting some very effective filmmaking. Thanks! I’ll check it out right now. Thanks for the comment. Glad you agree. Just followed your blog. Thanks! I’ve gotten the most laughs out of this movie. I watched this the other night when it was on Cable and now I feel like I should see Hot Fuzz again. Thanks! This was playing on TV the other day and I had a great time revisiting it. I think this is the funniest of the Cornetto trilogy. So much damn fun to watch, and only gets better with repeated-viewings. However, I bet you knew that already. Good review. Thanks! I’ve seen it about three or four times and it does get better each viewing. This is my favorite of the Cornetto trilogy. Just re-watched this one recently, it was on HBO Go i think. Still cracked me up and I, especially like the way they dealt with his relationships. Thanks for the comment. I saw this on Cinemax the other day. It was funnier than I remembered and I agree that Wright juggles the relationships around well. Thanks for the comment. I think I’d say it’s mine as well. It’s such a cool film. I felt a bit let down by Hot Fuzz after this. Still haven’t seen the World’s End though. 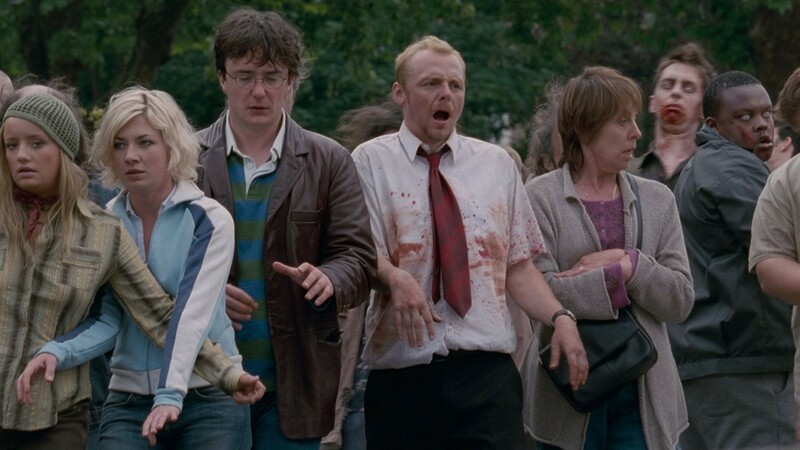 There are so many great moments in Shaun… it’s difficult to pick a favourite, but I think it might well be the bit when they drunkenly and unwittingly sing “White Lines” outside the pub with a zombie before they’ve learned of the outbreak! I agree, a great and very funny film. That pub scene’s one of my favorite moments, along with the Queen bit and the first zombie encounter.